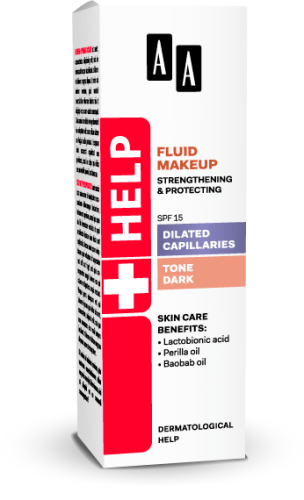 Skin care fluid make up for acne, steatorrhea, oily and combined skin prone to creation of blackheads. Recommended especially for sensitive skin prone to irritation and allergic reactions. Supplements dermatological acne treatments. It supports dermatological anti-acne treatments and is most efficient when used with AA HELP Acne Skin face creams. Skin Care Benefits are provided by active ingredients that improve the skin’s condition. Matt-complex (includes zinc gluconate, niacinamide and yeast extract) prevents the skin from blackhead breakout and normalizes the sebaceous glands, providing an immediate matte effect. Bisabolol has anti-bacterial and anti-inflammatory properties, while allantoin soothes irritation. Provitamin B5 effectively moisturizes and soothes the skin. Full Coverage is ensured by the mineral pigments, which ideally match and even out your skin tone. Warm tones ensure healthy skin colour. 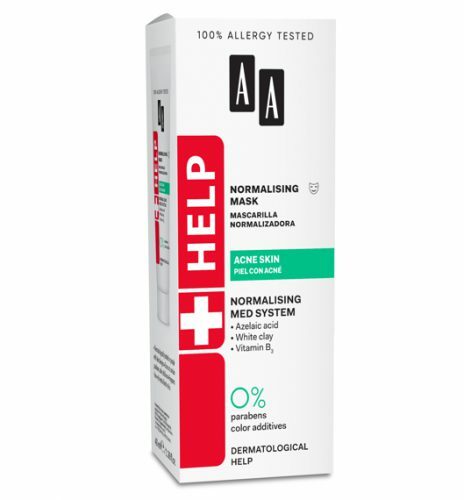 Always apply after the use of AA Help acne skin face cream. Aqua, Cyclopentasiloxane, Cetyl PEG/PPG- 10/1 Dimethicone, Glycerin, Dicaprylyl Carbonate, Nylon-12, Polyglyceryl- 4 Isostearate, Sodium Chloride, Biotin, Tocopheryl Acetate, Squalane, Glyceryl Stearate Citrate, Triethoxycaprylylsilane, Zinc Gluconate, Aesculus Hippocastanum Extract, Caffeine, Allantoin, Stearalkonium Hectorite, Ammonium Glycyrrhizate, Panthenol, Propylene Carbonate, Glyceryl Behenate, Niacinamide, Bisabolol, Faex Extract, Borago Officinalis Seed Oil, Hydrogenated Palm Oil, Cholesterol, Ceramide NP, Propylene Glycol, Ethylhexylglycerin, Phenoxyethanol, [+/- May Contain: CI 77891 / Titanium Dioxide, CI 77492, CI 77499, CI 77491]. • Developed with the help of cosmetologists and pharmacists • Dermatologically tested on people with skin allergies • Does not contain parabens • Fragrance free.